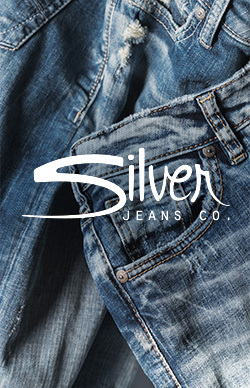 Silver Jeans Co. has been known for designing high-quality denim since 1991, and our slim-leg jeans are no exception. Taavi, Allan and Konrad make up our slim-leg category, giving every guy options to choose from. Plus, all three fits are offered in a wide variety of washes and fabrics, from traditional heritage denim to comfort denim that stretches without stretching out. Basically, everything you’re looking for in a new pair of jeans. Our slimmest-fitting jean, Taavi fits slim through the hip and thigh and is finished with a super-slim leg. This jean is made for the guy who wants a close-cut look that’s not too skinny or tight. Try a Taavi with a dark indigo wash, distressing and worn-in details for ultimate versatility. Looking for a little more room in the leg? Try Konrad, which as the same slim hip and thigh and a slightly roomier (but still slim) leg, giving you a streamlined look from hip to ankle. A Konrad with a deep indigo rinse and subtle fading and whiskering is perfect for day-to-night wear. If you’re a guy wants a slim-leg jean but needs a little more room in the hip and thigh, we’ve got that too. Say hello to Allan, which is designed with a classic fit and modern slimmed-down leg. Allan gives you a slender look that’s great for everyday. So whether you choose Taavi, Konrad or Allan, our slim-leg jeans are guaranteed to give you the sleek, streamlined style you’re looking for.